MilesTek, a leading manufacturer and supplier of products designed to address military and avionics applications, announced today that it has released a new series of power cords with low-smoke zero-halogen (LSZH) jackets. This new product line consists of six unique C13 to N5-15 LSZH power cords that are ideal for applications where it is critical to protect people and equipment from toxic smoke and corrosive gasses and where PVC cannot be used. Low-smoke zero-halogen cables are commonly used in a variety of military applications, especially in sealed aircraft environments and on electric boats (submarines). "Many of our customers, especially military contractors, were looking for LSZH power cords off-the-shelf, in lower quantities with immediate delivery. 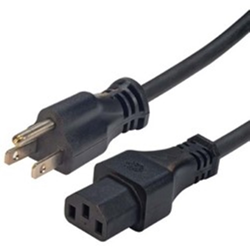 Until now, only custom solutions with high minimum order quantities and long lead times were available for these unique LSZH power cords. MilesTek now stocks these cables and offers same-day shipping with no minimum order quantities," said Mark Hearn, Product Manager. MilesTek’s new LSZH power cords are in stock and available for immediate shipment. MilesTek designs and manufactures a broad range of MIL-STD-1553B and Ethernet connectivity products to address Military Avionics, Aerospace, Industrial and government applications. In addition to a wide selection of off the shelf products, MilesTek can custom manufacture cable assemblies and harnesses. MilesTek is headquartered in Lewisville, Texas and is AS9100C and ISO9001:2008 certified. MilesTek is an Infinite Electronics company.